A car accident with injuries was reported to the Boston Police Department on Friday morning at around 8:30 am. Police were called to Columbus Avenue in reference to an accident with injuries. Officers arrived on scene and did find that injuries were sustained in this crash. The crash is still under police investigation and there is no word on what may have caused it to occur. Traffic on Columbus Avenue was slowed down temporarily as city residents made their way into work on Friday. The officers on scene were able to clear away the accident in fairly short order, however, and traffic was able to return to normal at the scene shortly after 9:00 am. All involved in the accident stayed at the scene to cooperate with the investigating officers. Accidents occur on Massachusetts highways on a daily basis. Some accidents tend to be very dangerous due to a combination of factors. Some of these factors include higher speed limits, congested travel areas and drivers who speed or otherwise do not obey traffic laws. Whatever the reason, an innocent victim should not be left to suffer without receiving compensation for their injuries. In order to establish liability in a highway accident case, an injured victim must first show that the other driver was negligent and that their negligence led to the collision. Once negligence is established, the injured person then must show that they have been damaged. Damages in a typical personal injury case include medical bills, pain and suffering, lost wages from employment and compensation for any injuries which are permanent or long lasting. An experienced personal injury attorney looks at these factors to ensure that you receive the best possible outcome from your case. If you or a loved one have been injured by the negligence of another please contact our office as as soon as possible. 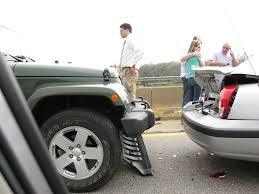 At the Law Offices of Jeffrey S. Glassman, we zealously protect the rights of accident victims.